Diane, your friends are wrong. They have been affected by the scepticism of a sceptical age. They think that nothing can be which is not comprehensible by their little minds. 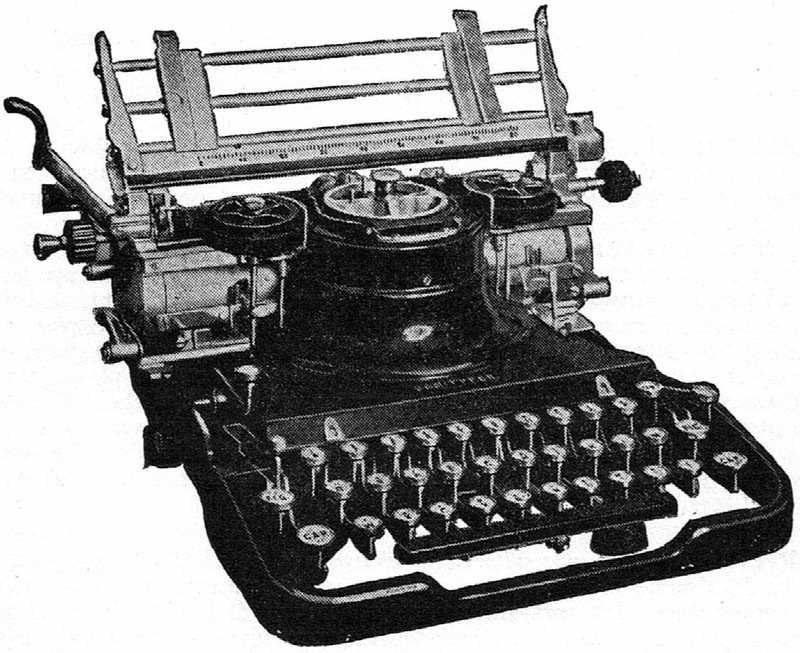 Six days earlier, almost to the hour, I had been tempting the typewriter gods by scoffing at a suggestion in that morning's The Sydney Morning Herald, that in 1927 J.R.R.Tolkien (Lord of the Rings) had bought himself a "Varitype" typewriter. Happily, I saved myself a few blushes by checking and finding out that Wim Van Rompuy had a manual Varityper on his typewriter.be website. Later I recalled that Georg Sommeregger had come across a Varityper in Cologne almost exactly a month earlier. In the case of the Varityper Georg photographed, it has the pitch-switch on the side, the brittle Doler-Zink of Brooklyn castings and the dinky little platen knobs, both sides, the same as mine. Except mine is set to toggling from 10- to 14-characters per inch, as opposed to 10 to 12-CPI. 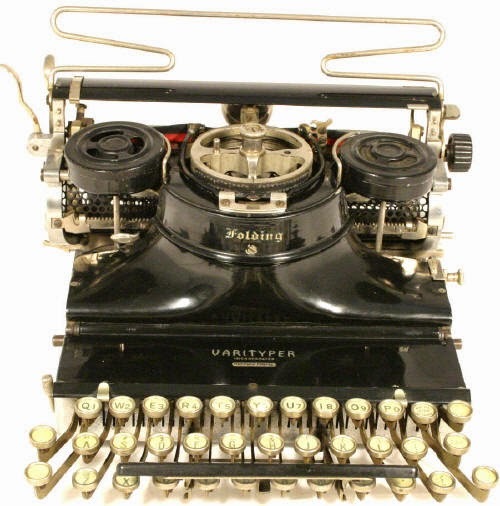 There is also a pitch-switch on the Varityper from the Virtual Typewriter Collection of Enrico Morozzi on the Typewriter Database. The serial number on mine is 401585 9. This distinct variation of the Hammond, based on the 1916 Multiplex, was designed by Phelps, New York-born Arthur Stalker Wheeler (1869-) in 1922, toward the end of days for the Hammond company. Following the death of James Bartlett Hammond in 1913, Neal Dow Becker (1883-1955) ran the company, which had been bequeathed by Hammond to the New York Metropolitan Museum of Art (with the assets estimated as being worth $800,000). Becker tried valiantly to revitalise Hammond by restructuring and refinancing it in 1921, but things began to go downhill and in January 1922 the Corporation Trust Company was authorised to transfer its stock. Hammond was merged with the office supplies corporation, Kroy Typewriter, which had been established only days earlier. 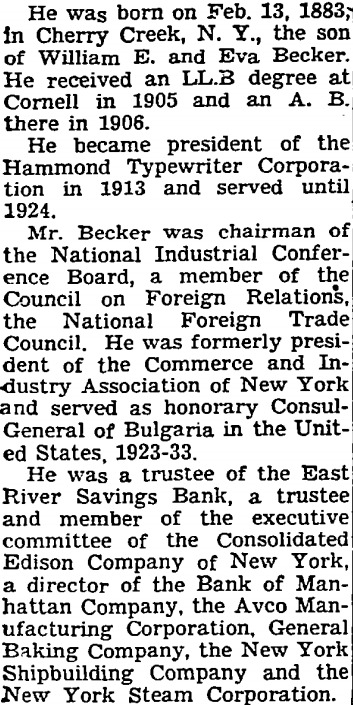 Becker packed up and left in 1924. The end for the original company came with a devastating fire on June 23, 1926, which raged from 42nd to 90th streets in Manhattan and engulfed most of Yorkville and the East Side, including the Hammond factory on East 69th Street. The fire caused $500,000 in damage and stripped Hammond of much of its remaining assets. What was left, notably patents, was acquired by civil engineer and investment banker Frederick Taylor Hepburn (1873-1956), who established the Varityper Corporation. Hepburn was a wealthy property owner and highly successful financial speculator who had special interests in Pennsylvania and Ohio power systems. 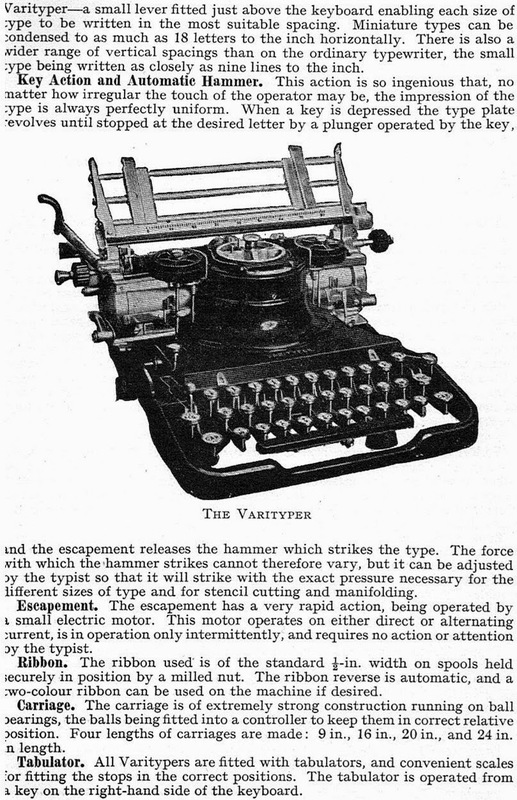 Hepburn saw potential in the Hammond as an typesetting machine and had both manual (1927, with Wheeler's variable carriage feed mechanism) and an early electric version of the Varityper (1929, largely through Frank Harris Trego's designs) produced. He then sold out to Oakland-born Ralph Cramer Coxhead (1892-1951) and the electric model was extensively developed by first Trego (1873-1967) and then Charles W. Norton (1890-1952). The rest, as they say, is history. By the time Hepburn died, his contribution to all this had long been forgotten. 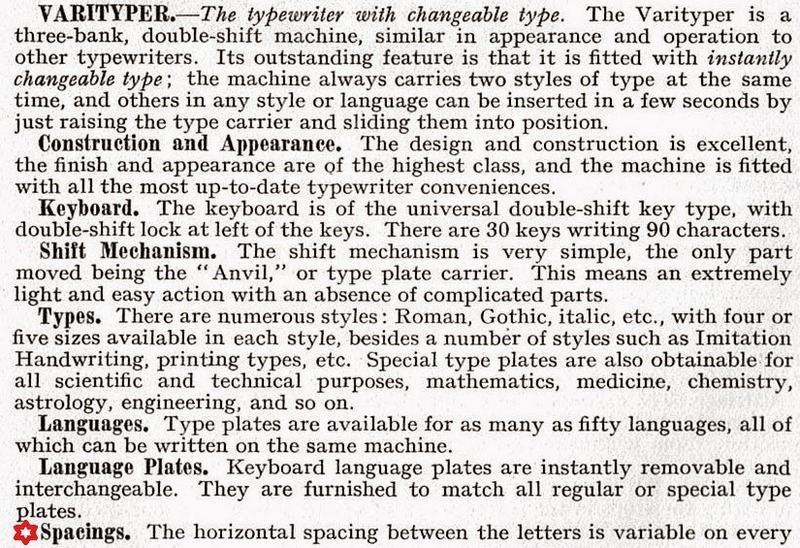 In fact, by 1935, the Hammond was already being described as a "relic" and an "antique typewriter". 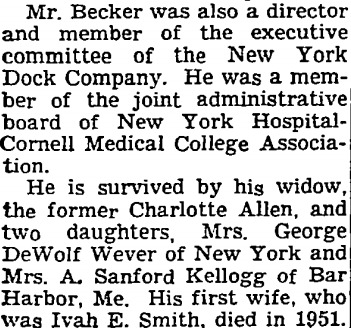 Becker, meanwhile, went on to run Intertype (which developed the Vogue typeface) from 1926 until 1952. "Kroy Typewriters"??? so there might be a link between your Varityper headline setter and my Kroy lettering system after all? I wonder if it was the same Kroy corporation? Also, curious if Kroy actually produced typewriters. If there's any evidence that they did, I should probably add them as a manufacturer to the TWDB. Hi Ted, there HAS to be a distinct possibility of a link, it's a very unusual name. I will check further. The men behind the foundation of Kroy in 1922 were called J.L.Watson, T.E.Halls and F.H.Butchorn. They didn't make typewriters. Ted, I've added the relevant January 1922 announcements from The New York Times. Congratulations on the fine typewriter. My Hammond Multiplex has a similar, if not identical, keyboard. Like Ted, I wonder about Kroy and typewirters. I've used Kroy machines, but never heard of a Kroy typewriter. I also never knew Kroy was around since 1924.